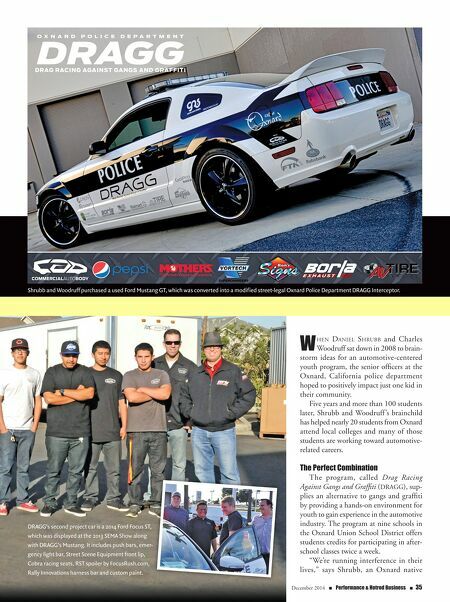 December 2014 n Performance & Hotrod Business n 35 W hen Daniel Shrubb and Charles Woodruff sat down in 2008 to brain- storm ideas for an automotive-centered youth program, the senior officers at the Oxnard, California police department hoped to positively impact just one kid in their community. Five years and more than 100 students later, Shrubb and Woodruff 's brainchild has helped nearly 20 students from Oxnard attend local colleges and many of those students are working toward automotive- related careers. The Perfect Combination The program, called Drag Racing Against Gangs and Graffiti (DRAGG), sup- plies an alternative to gangs and graffiti by providing a hands-on environment for youth to gain experience in the automotive industry. The program at nine schools in the Oxnard Union School District offers students credits for participating in after- school classes twice a week. "We're running interference in their lives," says Shrubb, an Oxnard native Shrubb and Woodruff purchased a used Ford Mustang GT, which was converted into a modified street-legal Oxnard Police Department DRAGG Interceptor. 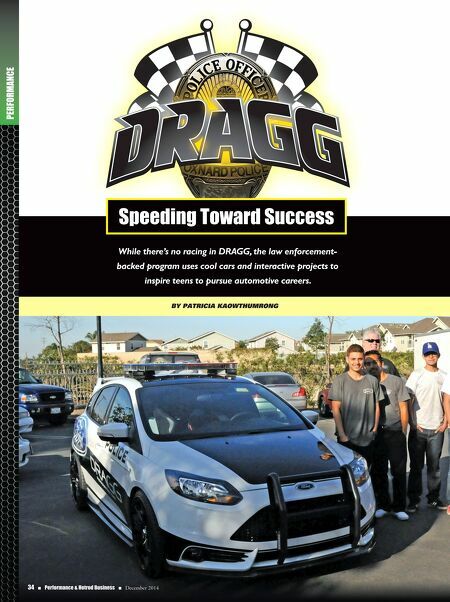 DRAGG's second project car is a 2014 Ford Focus ST, which was displayed at the 2013 SEMA Show along with DRAGG's Mustang. It includes push bars, emer- gency light bar, Street Scene Equipment front lip, Cobra racing seats, RST spoiler by FocusRush.com, Rally Innovations harness bar and custom paint.